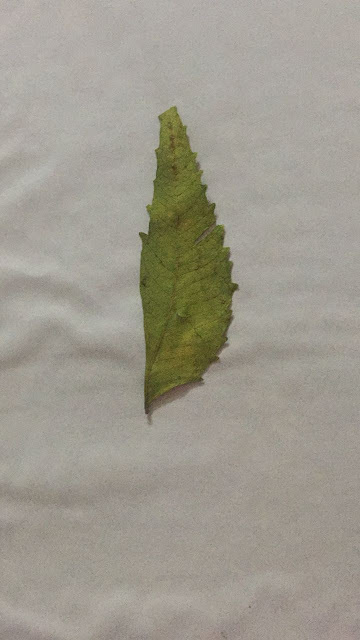 Lord Sai Baba Himself Gave Me ‘The Neem Leaf’! On 1st April 2016, I had been to Shirdi as I couldn’t make it for my birthday on March 16. After blissful darshan I went to Gurusthan and was looking for ‘The Neem Leaf’. Then I requested priest there to give me ‘The Sacred Neem Leaf’. At that time it was not that strict and there were no CCTV’s unlike now and they were allowed to give. He did give me but it was yellowish. So I again requested him to give me a green Neem leaf, fresh one. He got angry and went away. This got tears in my eyes. I was trying to control as my husband Rahul would scold me for crying for petty thing like leaf, they were flowing ceaselessly. When he learnt the reason for which I was crying he was surprised that I would cry so badly for ‘The Neem Leaf’. 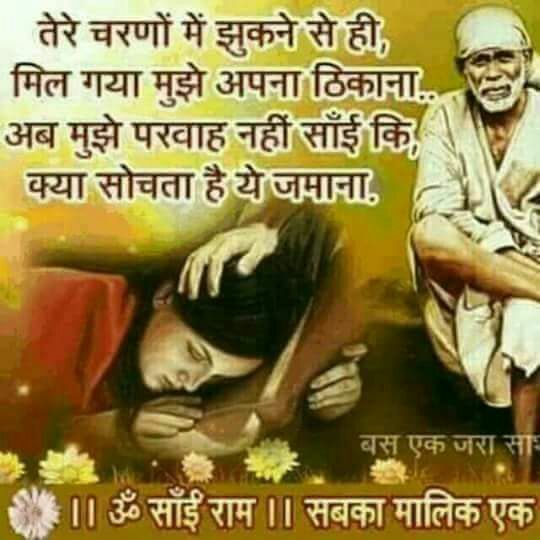 On the other hand I was thinking that Baba would never let His daughter leave Shirdi crying and He Himself will come and give me ‘‘The Neem Leaf’’ as I had been to Shirdi for my birthday. But nothing happened that way. He Himself did not come and give but He made sure that I got two Neem leaves which our driver gave me, as somehow he too had come to know for what I was crying so badly. But I was not happy with it, as of now, like a kid I wanted Baba only to come and give It to me. See He has His Own ways! Each devotee has special and an unique bond with Baba which only that devotee can understand. Baba is my Everything and my friend too, so I do get angry with Him. After the return I again went to Shirdi two times in the month of September and November. But as I was angry with Him for that Neem leaf, I had decided that when I visit Gurusthan for darshan and if I get the Neem Leaf I would pick it up but I won’t ask or pray Baba for it as He would give me if He wished. So during both the visits I returned without getting any leaf. Then in the month of November Baba inspired the thought of MAHAPARAYAN. I discussed with few and everyone said if Baba wishes nothing is impossible. But I felt incapable to undertake it. In the month of December my mother’s side family were going to Shirdi and I too was asked to join. As I had office that day, I said no to them although I wanted to join them. I was praying Baba to call me as well and said, “If You call me to Shirdi I will consider it as a positive sign for MAHAPARAYAN and somewhere I felt that it was impossible for me to join them due to the circumstances. But as Baba says that in a moment God Can Turn The Situation Around and so did it happen! The circumstances became such that there was no one to be with my son Saiesh who is just 3.5 years old and as he is my first priority I was left with no other option than being at home with him and for him. So instead of being at home I and Saiesh joined my mother’s side family for Shirdi which was actually my heart’s desire. I was so happy I can’t explain. Then I totally forgot about it and was moving round The Sacred Neem Tree. When I was almost done I happened to have an eye contact with an old man in white shirt, white dhoti, white warkari (a pilgrim) cap, with a bold enough circular sandal tika on the forehead, just like that is put on Baba’s Samadhi idol in Shirdi, Who was standing with a stick for support near Gurusthan at a distance of almost 5 to 6 feet with many people in between us as that day it was very crowded. I felt something different as those eyes did have that spark as our first meeting which I mentioned in the previous post, but it was little less than before. I had the feeling Is He Baba? Then to confirm I first checked whether He was wearing chappals (footwear) as He had not worn them last time and later while reading Sai Satcharitra it struck that Baba too did not wear. Then I saw that the old man did wear chappals and so the over smart me said, “Ah, He is not Baba as He is wearing chappals”. Then when I gave up the thought of Him being Baba, again we both had an eye contact although we were at a considerable distance. Felt strange but still I ignored Him. Then after hardly few minutes when I was walking towards my family what I saw was that outside the donation office (which is near Shani, Ganpati, Shiv mandir) my mom and son Saiesh were sitting on a bench and the same old man was there and talking with my mom. I was now little more surprised and wondered that there is definitely something strange, as right now at this moment there are thousands of people here and how and why this same old man has to go and meet my mom only? I hurriedly walked towards them and enquired mom what He was saying. She said,” He is asking some money for tea. What should I do?” I said, “ok give 10 rupees then”. Then she gave me 10 rupees and said that you only give Him. Although I was surprised at the answers but had not fully realised the essence of it, I felt like touching His feet, but I did not, thinking that people will take me mad that to any old man in white clothes I take Him to be Baba. Although my doubt that He is Baba was slowly getting confirmed, I still ignored Him thinking that people would laugh at me if He was not Baba. Then He walked away. After few minutes all 7 or 8 of us started walking towards the Shani, Ganpati, Shiv temple. As we were walking I again happened to see the same old man Who was sitting outside the Ganpati temple and this time He called me signaling with His hand. He said that He wanted to give me something but He had forgotten and He started putting His hand inside the pocket which was located near His stomach. I was again astonished and by the time He removed His hand from the pocket, in those few seconds I believed that He is Baba only and like in Sai Satcharitra He is now going to give me back some amount from the dakshina of 10 Rs which was given and I would treasure it and never spend it lifelong even if it was one or two rupees. Eagerly I went and stood in front of Him and He with His right palm facing sky with ‘A Single Neem Leaf’ placed on it extended His hand towards me…! I myself had forgotten about the statement that I had said few minutes back to Baba about the Neem Leaf but Baba had not. Then what to speak? I was on cloud 9, I did not think of anyone ( now there was no wall between us about what people will think) and started crying out of joy and placed my head at His Feet, held them and was not ready to leave Him as now I did not have any doubts of Him being Baba. I cried, I wept and was overjoyed to be at His feet so closely and wished to wash His feet with my tears. Then He said that He was an ordinary man and that He had no one. Then He said that He had to leave then. I said, “No Baba, You are not going anywhere. With others You spend three-three hours (my friend Rakshita’s experience) and with me wait atleast for 5 minutes. He was getting up and I was crying out of joy and literally pulling Him down to sit and this went on repeatedly. He also said if He did not go then there would be a problem and security people would scold Him. I said, “Baba, who can scold You here? Please wait”. I asked Him where is it that He had to go so hurriedly. He answered, “Temple”. I gave Him 100 Rs. and bowed down again and then He said, “Kalyan Ho, Kalyan Ho”. As my family members were not fully aware of the whole episode, they even laughed at me. Although I was not allowing Him to go and was telling my mom that He is Baba only and as He was Baba only He managed me to somehow let Him go. I was feeling blessed that Baba called to Shirdi, met and even gave the Neem leaf as a signal For Mahaparayan. What else could I ask for? This was actually the first confirmation given by Baba to go ahead with MAHAPARAYAN, later the dream (Yesterday’s post) was the second one. My family members were astonished at my behaviour and were laughing recalling the way I was pulling Him back. But later when I told them everything they too wondered and felt lucky to have got His darshan as they too had bowed at His feet and had given Him 100 Rs as dakshina. Now I was recalling back everything. Baba had answered, “Datta” on being asked where He came from? And I was thinking that He must have not heard right. Right was He; as Sai Baba, Swami Samarth, Gajanan Maharaj all are incarnation Of Lord Datta! When again asked He said that He is there at Shirdi and from Shirdi itself. Also when asked where He wanted to go so hurriedly and He said Temple! Why didnt He call my mom or someone else and How He gave only a single leaf, about which even I had forgotten? He saying “Kalyan Ho, Kalyan Ho!” rarely an ordinary man would say it that way. Also in that span of 15 to 20 minutes He came across me three times and that too He was always ahead of me each time. Later I was there in Shirdi for more than an hour and even kept looking for Him but I couldn’t find Him anywhere again! Baba’s leela doesn’t end here. This all happened on 30th Dec. 2016 Friday and on 2nd Jan. 2017 Monday my mom was telling my mother-in-law about the old man. At the end my mom said one thing we did not understand that He was such a poor man by clothes and why did He leave His chappals there which were good enough and go away? When I heard this I was shocked and exclaimed, “What? He left His chappals? Why dint you tell me before? That was the first thing that I had checked at Gurusthan, whether He was wearing chappals?” To this she said that me too was there when all this was said when He had left, but somehow I had not caught it as overwhelmed with gratitude and joy was I! But Baba made sure that I come to know about the chappals too and that however smart we try to be, He plays His leelas well, after all His ways are His Ways! Such a beautiful story.. I feel blessed reading it. Faith never fails. always be faithful, god bless u all, om Sai ram. What a beautiful experience! May Sai Baba bless us all. Om Sai Ram ji... Sai hi Sai..
Sai nadh pardhu.. Thank u so much for blessing us to read this and feel as if u were with us ..